Nepal is blessed with rich natural attributes and sophisticated cultural history. More than anything else it is the birthplace of Buddha (light of Asia) who led the world towards peace and serenity and the land of Mt. Everest (Sagarmatha ), the top of the world. It is a sovereign, independent Himalayan kingdom with India in the east, west south and with the Tibetan autonomous region of p.r. china in the north. Nepal is the land of remote mountain villages where people survive by growing their own food on the thousand of hill terraces that scale even the steepest lopes. It is well known as a mystical land of unparalleled verities with the altitude of 70m above the sea level in the south & 8848m height of in the north. This vast diversity in altitude is reflected in our unique culture.Nepal is in Southern Asia, between China and India. It covers total area of 143,351 sq km and its boundary is 2,926 km long in total, bordered by China 1,236 km and India 1,690 km. It is a landlocked country. Kathmandu is the capital, and Nepal has 30 millions people. 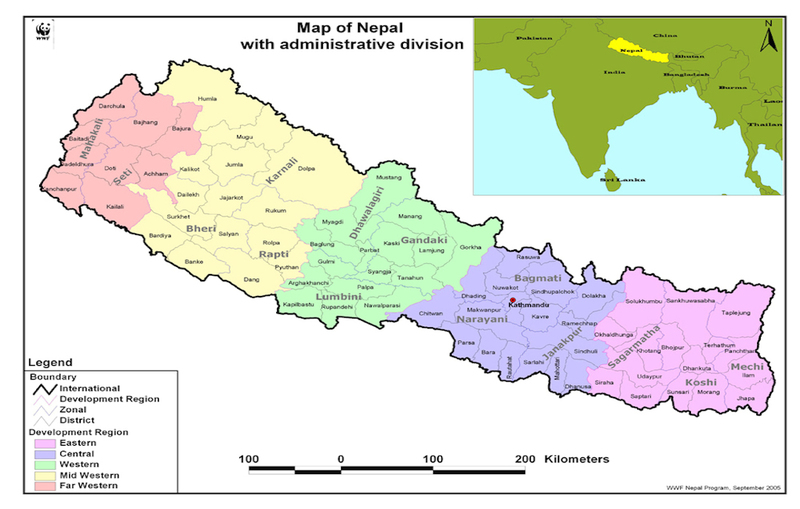 Government: Democratic Republic of Nepal.